1. Ometz Lev / Courage: The Chanukah story emphasizes the bravery of the Maccabees and those who stood up for the freedom of being Jewish. Talk to your jkids about their heroes and share examples of people who inspire you. 2. Tzedakah / Justice: It’s fun to receive gifts for Chanukah—and also important that we teach our children about the Jewish value of Tzedakah. Dump out the coins in your Tzedakah box and count them together. Talk about places where your family would like to make a donation. It doesn’t need to be only money—it could be sharing gently used toys and clothes! 3. Ha’achalat Re’evim / Feeding the Hungry: Chanukah time is also a time to think about people who may not have enough money to celebrate the holiday—or enough money for the food they need. You can volunteer as a family at JRA or take canned good to the Mitzvah Food Pantry. 4. Bal Taschit / Not Wasting: What happens after you unwrap Chanukah gifts in your home? Engage your jkids in the mitzvah of Bal Taschit, not wasting. Kids can carry cardboard boxes to your recycling bin and use old giftwrap for arts and craft projects. 5. 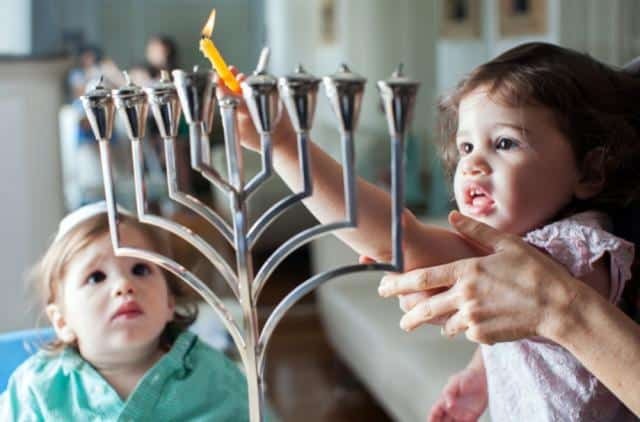 Hachnasat Orchim / Welcoming Guests: It’s always a mitzvah to welcome guests in your home and at Chanukah time, there’s an opportunity to reach out to another family to join you for candlelighting, dreidl and more Chanukah fun. Invite a family who isn’t Jewish and teach them about traditions. 6. Bikur Cholim / Visiting the Sick: Many of us have older relatives in nursing homes who would appreciate a Chanukah card or picture drawn by your jkids! Download and print our cards. Jewish children who are in the hospital could also use Chanukah cards! 7. Hochma / Wisdom: PJ Library has so many wonderful Chanukah books available—you can pick one to reach each night or have a special book night in which everyone gets to pick their favorite story. 8. Al Ha Nissim / Declaring the Miracle: It’s a Jewish tradition to place the Chanukah menorah in the window for everyone to see. Take a picture of your family on the last night of Chanukah and post it on so we can celebrate with you!